Burgums of the "FF" family tree lived here, or nearby. 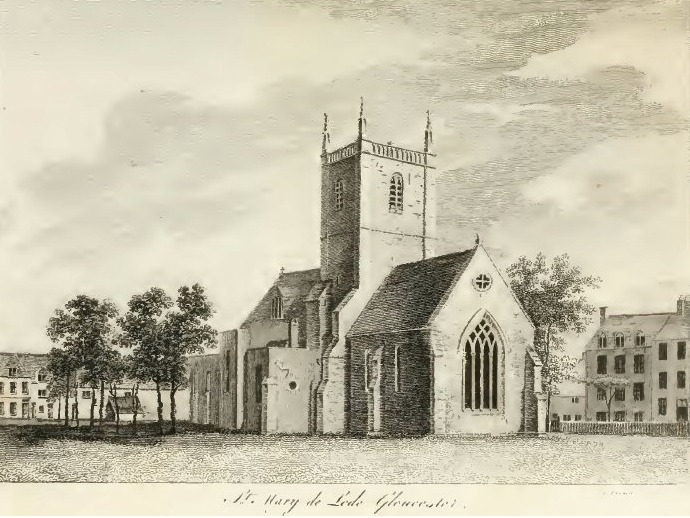 ST MARY DE LODE, GLOUCESTER, next to the grounds of Gloucester Cathedral.The word Lode is Old English and refers here to a ford or ferry that once crossed the River Severn near here. The church is built over two Roman buildings. There are claims that the original Christian church here was the first in Britain. It is also believed that King Lucius, the first Christian king of Britain (second century) was buried here. The church has Norman central tower built about 1190.The nave is in the early Gothic Revival style and was rebuilt in 1826 with cast iron columns. The chancel was begun in the 1190, extended in the 1200s. More restoration took place during the nineteenth and eary twentieth centuries. The Roman mosaic floor can still be seen in the church.The parish also includes St Mary de Crypt and St Swithuns. The list below shows the baptisms, marriages and burials that took place at St Mary de Lode, Gloucester.